As someone who loves coffee and entertaining, it’s no surprise that I adore the Tassimo T47 single-serve brewer for entertaining! Over the holidays guests are stopping in, often unexpectedly this home brewer makes it simple to offer guests a delicious drink. Give yourself a break this holiday season and make entertaining easy with the TASSIMO T47, the latest in at-home brewing technology from BOSCH. With its patented barcode technology and fast brewing time, you’ll be able to create customized hot beverages to warm up all your guests in a flash – even those with shiny red noses. The TASSIMO T47 features patented barcode technology which automatically adjusts water level, temperature and brew time to brew the perfect cup in about a minute. Make everyone merry with a wide variety of beverage options including coffee, espresso, cappuccinos, lattes, Americano, hot chocolate and tea, plus the new holiday beverages Pumpkin Spice Latte and Peppermint Mocha. Features a large water tank, easy to use brew chamber and a stainless steel drip tray that accommodates even the largest festive mug (perfect for Santa’s goodie tray). Fully automatic one-button operation with an integrated LED user interface. Entertaining family and friends this holiday season has never been easier with the creation of a DIY coffee bar! Instead of spending all your time playing bartender and taking drink and coffee orders, why not create a fun and festive DIY coffee bar and let your guests be their own barista. It makes it more fun, interactive and customizable for guests – and even kids can make their own hot chocolate! Guests can create customized festive beverages like peppermint mochas and pumpkin spice lattes with the Tassimo T47 single-serve brewer, giving them a true café-style experience. For festive flare, set out holiday mugs and bowls of crushed candy canes, chocolate shavings, cinnamon sticks, mint leaves and whipped cream to garnish. The T47 by Bosch is the only home brewer that uses barcode technology, brewing the perfect cup of coffee, cappuccino or latte every time. As temperatures drop and winter weather arrives, there is nothing cozier than enjoying a warm, festive beverage in the comfort of your own home. Instead of trekking to the nearest coffee shop, treat yourself to this irresistible peppermint mocha coffee with your Tassimo T47 from Bosch. Prepare 1 Chocolate Syrup T Disc in mug or heatproof glass. Use same mug to prepare 1 Espresso T Disc. Moisten rim of mug with wet paper towel, then dip rim in finely crushed candy canes on a sheet of waxed paper. Let stand, inverted, on waxed paper until ready to fill with beverage and serve. 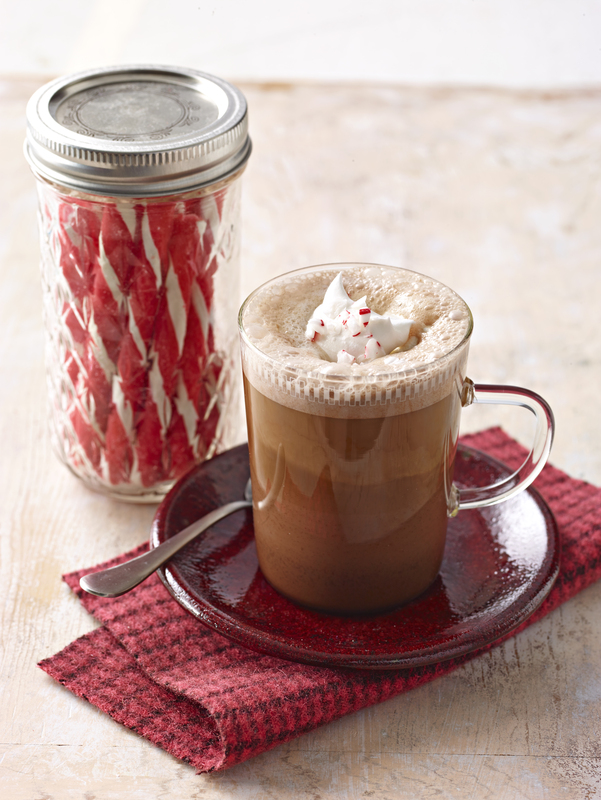 For a festive twist, add a candy cane to filled mug; use as a stir stick. Prepare using a crushed peppermint stick or hard peppermint candies. More beverage recipe ideas can be found at www.tassimo.ca. 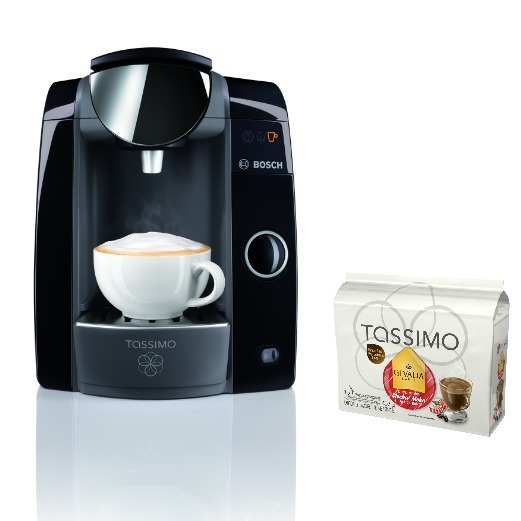 Who would like to WIN a Tassimo Home Brewer? 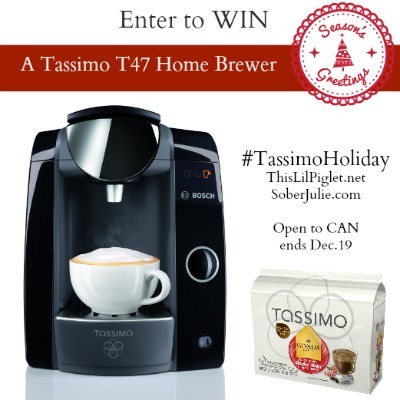 We have one Tassimo T 47 Single Serve Brewer retail value $199 to giveaway to one lucky Canadian reader. This giveaway is open to residents of Canada 18+ and runs until December 19th. To enter fill in the Giveaway Tools below. Good Luck! If you’re looking for Christmas gift ideas for more people on your list, make sure to check our the rest of our Holiday Gift Guide features. Disclosure: We were provided with product in exchange this advertorial. All opinions are my own. My favourite coffee is mocha. ussuly regular coffee, but sometimes pumpkin or gingerbread lattes! I like French Vanilla and also Hazelnut flavoured coffee. My Favorite coffee beverage is caffe latte, I love my coffee with a lot of milk! Thanks! Half coffee half hot chocolate!! I love iced caps from tim hortons, but I also love to make my own iced coffee! Regular coffee. Yes I live life on the edge. i like a simple double double! Right now I am enjoying a cafe mocha! My fave is a peppermint mocha which I’m now craving after reading this post!! I love Caramel Machiato coffee. I have one every time I go out for coffee with my girlfriends. I like a nice dark roast with some cream in it. French Vanilla cappuccino is my favorite! Hazelnut coffee is my very favorite. Vanilla and Gingerbread Lattes are my favs! Just regular coffee with some cream! French Vanilla is my fave!!!!! Coffee my drug of choice! My fav is just a plain latte!! Normally a straight op coffee-double double. But with the holidays coming, I think I’m making the switch to Peppermint Mocha! Regular old drip coffee, and lots of it too!! I don’t drink coffee… however Hot Chocolate is another story. Mocha in the winter and iced cap in the summer. I love black coffee! Like to taste the subtle differences in blends. Candy Cane Latte is my favourite! 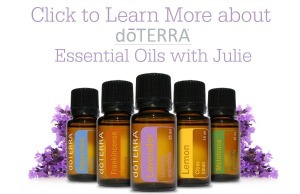 Love your blog and this contest! Eggnog Latte is my favorite. I love all the great beverage options Tassimo gives at the push of a button. Would love one for Christmas! Triple espresso with vanilla syrup. I like a darker roast of coffee. I love lattes and mochas for those cold winter evenings. Vanilla cappuccino is my top passion! French Vanilla Latte is my favorite drink! Hazelnut coffee is my preferred flavor. love latte’s and pretty much any kind of coffee. My daughters fave is French Vanilla, to be honest she is the coffee drinker, I do tea and hot chocolate instead :) That’s why I love the versatility of the Tassimo!!! I’m old fashioned..for me just a regular cuppa! Anything with caramel sounds yummy! I love just regular plain old coffee ! My treat is a chai tea latte in the Tassimo. For regular coffee – a french vanilla is nice . Regular coffee with Cinnabon cream! I love espresso drinks like latte’s and mocha’s. Hazelnut coffee is my favorite!! My favorite is a Mocha Latte with Whip cream on top! Mmmm! Hot Chocolate…its real good in a tassimo!! I like my coffee quite sweet so my first cup would be a Tim Hortons triple triple!! I like my coffee with just a hint of milk. occasionally I like a Mocha. I am pretty basic with coffee. If I have anything different it would usually be an unsweetened mocha, with a bold coffee. I like cafe au lait – it’s the best way to drink coffee in the morning for me. Sort of ease into the day. Mocha is my drink of choice. My favourite drink is caramel latte. I love any type of mocha or gingerbread latte! I really like the Gevalia Caramel Macchiato mixed with some hot chocolate. It’s amazing! I love my coffee with a twist of caramel and vanilla.